To celebrate international women's day, the American Chambers of Commerce announced the Egyptian winners of MENA Women Award. For the fourth year the American Chambers' MENA council sheds light on women in business in the Middle East who are no longer in the background but rather in the forefront of the business scene in the region. The award had five categories this year after adding a category for best bank supporting women-owned and women-run businesses, which was awarded to Commercial International Bank (CIB). CIB was awarded for the special programs it offered that are especially tailored for women like the 'Heya Credit Card' and offering finance access to women at competitive interest rates. 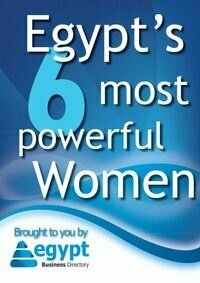 P&G dominated the second category, best company for women to work for, with 41.4% of its employees and 30% of its senior management in Egypt being women. P&G supports gender diversity and inclusion and praises women for delivering outstanding organizational results. 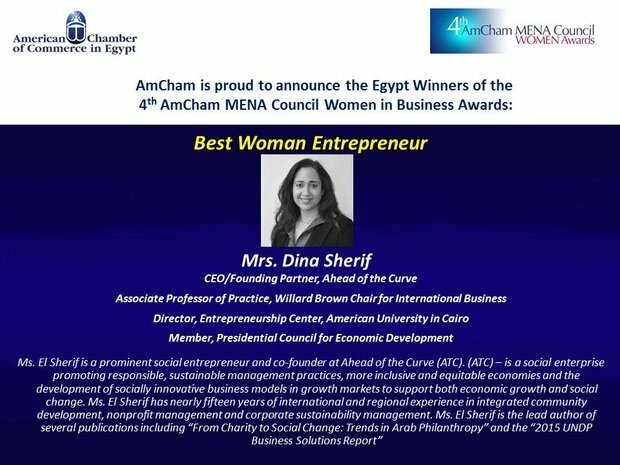 The third category, best women entrepreneur, was awarded to Mrs. Dina Sherif CEO and founding partner of Ahead of the Curve. Sherif is also the director of the entrepreneurship center at the American University in Cairo and member of the Presidential Council for Economic Development. Ahead of the Curve is a social enterprise that calls for more equitable and inclusive economies, more sustainable and responsible management practices and development of socially innovative business models that can bring about both economic growth and social change. Mrs. Yasmine Helal won the fourth category, best woman non-profit. Helal is the founder and executive director of Educate me, a voluntary, fundraising-based initiative to school financially challenged children. Educate me now builds community schools and trains teachers to contribute to its skill-based educational model. Winner of the best women in corporate sector category was Mrs. Zeinab Hashem, CEO and managing director of ADIB capital. Hashem is an icon in the banking sector with more than 35 years of experience. She worked on improving foreign currency liquidity of NBE and increased the bank's earnings from EGP 400 million in 2008 to around EGP 3 billion in 2013/2014. With the ever-rising entrepreneurship and SMEs sectors there are more opportunities for women to not just contribute to but dominate business in Egypt.